Swank's Shell Inlay, Inc. welcomes YOU ! Welcome to Swank's Shell Inlay, Inc where Swank's artists and craftsmen can restore the beauty and value to worn or damaged antiques and musical instruments. We create inlay parts and designs from Abalone, Mother of Pearl, Sea Snail, and other shells for custom or restoration inlay work. We stock tools and shell blanks for inlay craftsman and hobbyist, and we can do complete custom inlay work and restorations. As you look through the site, double click on any of the graphics to see more detail of the natural materials and the inlay work. Browse the Online Catalog from Swank's. Get Swank's Shell Inlay Catalog now. Browse shell descriptions of Swank's high quality shell blank materials. Browse examples of antique and musical instrument repair and restoration and samples of OEM quality inlays. Browse tools and supplies for the inlay craftsman and hobbiest. Contact Swank's Shell Inlay, Inc. to order a product or get an estimate on custom work. Read a brief lesson on mother of pearl inlay. Owner Bill Swank collects antique pocket watches and related items. Swank's Shell Inlay creates and stocks a range of Ready-To-Go images in a variety of natural mediums including abalone, sea snail, mother of pearl, ebony, and ivory. See the shell blank section for a listing of available shell blank inlay materials. Swank's is the best shell inlay facility in North America. We provide our customers with OEM standard and custom inlays, musical instrument, antique, and heirloom repair and restoration. Swank's has both online and downloadable catalogs. We can also deliver custom work to your specifications for you to inlay, or we can create the inlay, set it, and complete your project or repair. Swank's Shell Inlay sells tools and supplies for the inlay cutting and mounting craftsman and hobbyist. Get our Swank's Shell Inlay Catalog or e-mail us with your custom requirements for a quote and estimated delivery time. Swank's Shell Inlay has daily UPS pick up with overnight shipments available to most US locations so we can have your order to you quickly. Our staff of skilled craftsmen and artists can create the artistic addition to your musical instrument, antique, collectable piece, furniture or billiard table, and inlay that standard or customer artwork in your piece shipped to us, or we can ship the work to you for you to inlay. You can provide a graphic in PDF, JPEG, TIFF, GIF or other common bitmap or scanned image of the art work you'd like, and our staff will provide an estimated cost and delivery time. You can also provide a written idea of the image you want and where you want it inlaid, e.g., "Could I get a butterfly cut from red abalone and inlaid on the 12th fret of my guitar?" and we can provide examples of similar artwork or create a new image for your approval. Custom work requires a 50% deposit when the order is placed. Here's our catalog. Our abalone and pearl patterns are copied from original instruments and are hand-cut, ready to inlay. We offer a complete line of custom services, from cutting your custom patterns and your trim, squares, diamonds, etc. to inlaying them into your instruments, blank fingerboards, pegheads, veneers, or whatever. Please e-mail us for an estimate. We stock a full line of pearl and abalone blanks and strips, stars, squares, diamonds, dots, and decorative stripes with or without slots, and intricate design decorative strips. We also carry engraved mother of pearl inlays, and everything you'll need in pearl or abalone inlay. Custom engraving, diamonds, strips, replacement or new designs are available from Swank's. We have inlay supplies, saw frames, blades, mill ends, and OEM and custom patterns for the professional craftsman and inlay hobbyist. When ordering, please provide both the catalog number and the description of the items. For check or money order, add $5.00 for packing and handling. Orders not pre-paid will ship UPS COD. Orders shipped outside the US must be paid by a check or money order drawn on a US bank in US funds. These orders require $6.00 for for packing and handling. Maryland residents add 5% sales tax. The quality of product and workmanship produced by Swank's Shell Inlay is guaranteed. If you are not satisfied, the items can be returned for exchange or refund. Terms of sale and prices subject to change withour notice. ...and other fine musical instruments. Shell blanks are rough ground with 4 or 5 sides. Blank shapes are square to rectangular. Blanks sizes range from approximately 1 ¼ inches to 1 ½ inches square. Depending on thickness there are 6 to 9 pieces per ounce. Large blanks run 3 to 6 pieces per ounce and have one side greater than 2 inches long. Note: Swank's sells natural materials! Like leather or wood, variations occur within color groups and types of shell blanks. When Swank's craftsmen repair or restore inlay work on a musical instrument or antique, they will attempt to match the color, figure, and other characteristics of the original material. When we fill an order for shell blanks, we hand-select pieces which will match if used as multiple inlays on the same project. However, we cannot guarantee identical appearance in natural materials. 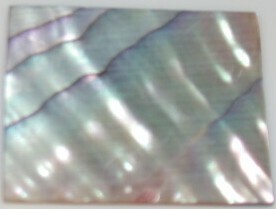  Mother of Pearl - pearlescent, colors range from white to silvery to gold, often includes some figure and background color. 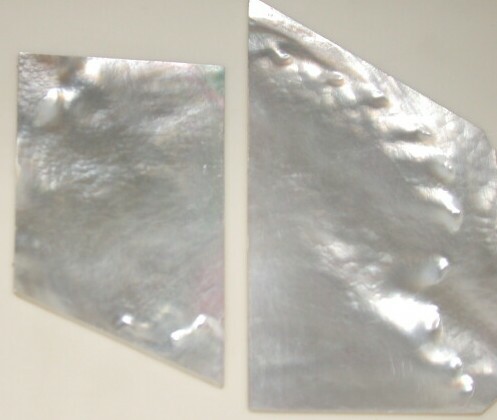  Scrap Pearl - Pearl blanks with designs cut from them, but still with usable material for small designs. Order #148 at $2.00 per ounce.  Red Abalone - colors predominately red, deep purple, green, pink with stripes or bullseyes. Some pale fiery pink.  Green Abalone - colors predominately greens, pink, blues, purple with more stripes and fewer bullseyes. Some ripple. Pale tends to be rippley.  Select Abalone - colorful with bold stripes.  Abalone Heart - congested nodules of intense color.  Second quality blanks - Second quality blanks have a fair amount of usable area but will be small, thin, or uneven thickness or may have scale or worm holes. Attention - inlay craftsmen and hobbyists!! Do you want to learn to repair missing or damaged inlays? Do you need to create inlays for your business or hobby? Swank's is the source for tools and supplies for inlay craftsmen and hobbyists. Swank's has end mills, saw frames and diamond blades, cutting lubricant, instructions and more. For the novice inlay craftsman, Swank's has the book Pearl Inlay by J. E. Patterson. This is an 81-page soft-cover illustrated reference book about working with pearl, and covers cutting, inlaying, engraving, tools and jigs. All end mills have a 1/8 inch shank. Swank's suggests using the 1/32 inch end mill for outline work, and using the 3/32 inch end mill to hog out the large areas, saving time and wear on the 1/32 inch end mill. The 3/32 and 1/8 inch end mills are great for routing saddle slots. Order 3 or more, $14.00 ea. Order 3 or more, $8.75 ea. The saw frame with tension screw adjustment is also adjustable for varying blade lengths with a 2 1/4 inch throat depth and hardwood handle. Saw blades are diamond grit. Order 3 dz. or more, $3.00 / dz. Item number #158, price $3.60. Bur Life is cutting lubricant. Apply it to saw blades for less friction and more control. Blades stay sharper and last longer. Bur Life works for most any grinding or drilling tool. Item number #159, price $12.75. This 81-page soft-cover instruction manual for inlaying abalone and mother of pearl is written by J. E. Patterson. This is an illustrated instruction manual on pearl working, and covers cutting, inlaying, engraving, tools and jigs. E-mail Swank's with your name and mailing address to receive the catalog in regular mail. Swank's can restore and repair missing and damaged shell and other inlay work on fine musical instruments, opera glasses, fine antique writing instruments, pocket knives, and other valuables. We can also provide inlay "dots" missing from pool or billard tables. Our extensive stock of shell blanks allow us to match a wide range of original inlay work. Click on the image below to see more detail of the inlay work in this work-in-process guitar fingerboard. Swank's stocks and can install OEM quality inlays for Gibson, Vega, Martin, and other fine guitars, banjos and mandelins. If you prefer to do the repair yourself, without shipping the instrument or antique, Swank's offers many OEM-quality pre-cut shell parts to replace missing or damaged inlay. You can also purchase patterns to repair original designs or add inlay. See Swank's Online Catalog to find the repair and restoration inlays you need, patterns for cutting inlay pieces, and shell blanks. Business hours are Monday through Friday, 9:00AM to 5:00PM East coast time. Select the spot where the pearl will be inlaid, and sand the wood smooth. Glue the pearl piece to the wood using Duco cement. When the glue is dry, scribe around the edges. Apply acetone to the pearl to soften the glue, but be careful if the wood has a lacquer finish, acetone is not compatible with lacquer. Carefully slide the razor blade under the pearl. Add acetone if the pearl doesn't loosen from the wood. DO NOT FORCE THIS OPERATION! When the pearl piece loosens and comes off, remove the remaining glue with acetone. Now rub chalk across the scribed line you made outlining the inlay piece. Wipe away the excess chalk. This should leave a very fine chalk line in the scribe mark. Mount the 1/32 inch end mill in your Dremel tool with router base. Route away the wood inside the chalk line to a depth slightly less than the thickness of the pearl inlay. Note that when using an engraved inlay, it should be inlaid absolutely flush with the surface of the wood. The final sanding steps should be omitted. Any sharp corners that cannot be properly routed can now be done with an Exacto knife using a #11 blade. Check that the pearl inlay fits exactly in the opening, if not, trim where necessary. Mix the epoxy thoroughly. Color it with coloring pigment, using using just enough to achieve the desired color. Fill the routed hole with the mixture. Gently push the inlay into the space forcing the epoxy up through spaces around the pearl inlay piece, leaving the pearl slightly higher than the wood surface (except for engraved inlay). 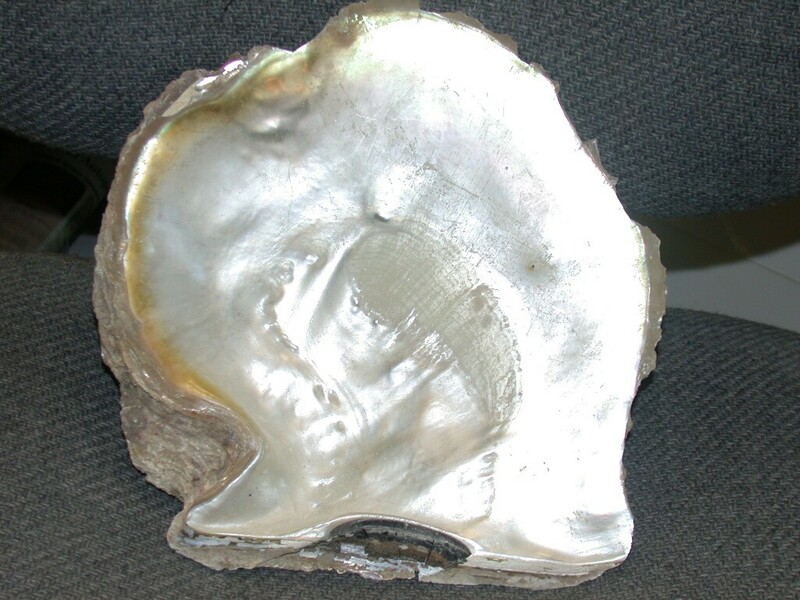 To prevent air bubbles from forming in the epoxy around the pearl, move a 100-watt light bulb over the inlay. The heat from the bulb will expand the air in any bubbles causing them to break on the surface. When the epoxy is thoroughly set, sand the inlay level with the wood surface using 220-grit sandpaper and a block. (Don't do this for engraved inlay.) After leveling, polish the surface with 400-, then 600-grit sandpaper. FLUSH INLAYING OF ENGRAVED PIECES. 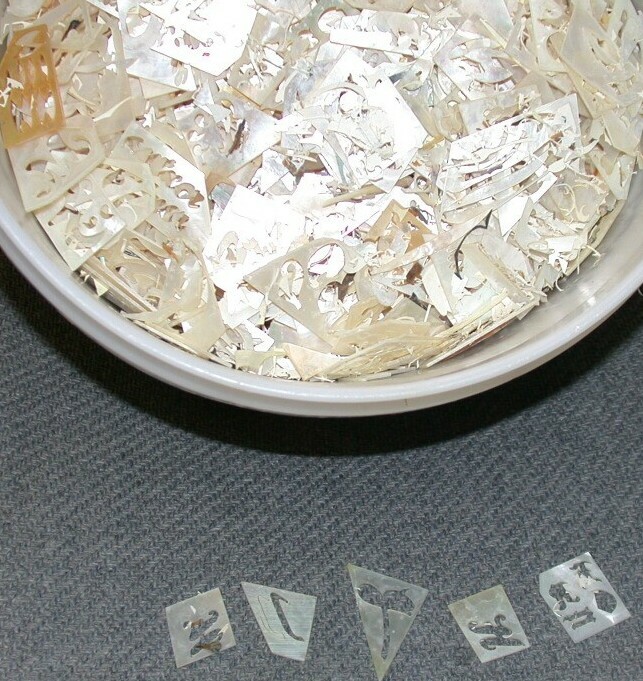 Use a piece of clear plexiglass slightly larger than the inlay piece. Apply the clear double-sided tape to the plexiglass. (I use Scotch-brand doublestick tape available in most drug stores.) Stick the engraved piece to the plexiglass, fill the routed hole with colored epoxy, just enough so when the inlay is eased into the hole a small amount of epoxy oozes from under the plexiglass. Use spring clamps to hold the plexiglass to the wood surface, e.g. a finger board, peg head, etc. Allow the epoxy to partially set up. While the epoxy is still slightly soft, gently push the plexiglass up and down, and side to side until it separates from the inlay piece. Then gently rub the excess epoxy off the work using your finger. There should be a thin film on the wood surface. I suggest you try this once or twice using pieces of scrap pearl and wood to understand the amount of epoxy, the clamping pressure, and the curing time needed. Here's a simple project - a poker chip inlaid in a block of oak. Create other tests and experiments based on your work or hobby! Bill has a collector's interest in older and antique pocket watches. If you have watches, watch cases, or related items to sell, especially Waltham watch company products, please contact us. Owner Bill Swank is a lifetime member of the ANTIQUE WATCH OWNERS ASSOCIATION. Thanks for looking at Swank's Shell Inlay, Inc. web page!